Solar Charge uses 40 years of proven experience and reliability to deliver cost effective solutions, on time and on budget. Started as a small family business in the early 1970's Solar Charge pioneered solar off grid systems in rural Victoria operating from its Martin St shop including an award winning house in 1975. 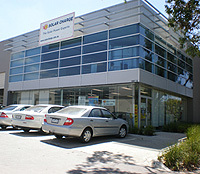 In the late 1990s we installed one of the first Grid connected solar systems in Melbourne using Solarex/ BP Solar panels. The strengths and experience of Richard Potter and Peter Israel is supported by the willing and knowledgeable technical team delivering what they promise. Solar Charge is "Big enough to do it right. Small enough to care". Solar Charge still provides quality systems for solar electricity Grid Connect, with optional battery back-up, and Off Grid systems to meet your needs. Solar Charge P/L is an Authorised LG Solar Dealer. This alliance with the LG brand continues our commitment to deliver quality panels and systems that will work effectively for decades, not just a few years. LG is a well respected brand in the Australian market, meaning peace of mind for our customers. They manufacture their panels at the LG Electronics factory. As a vertically integrated supplier LG keeps tight control on all processes through manufacturing. Solar Charge has been a Distributor of the Selectronic Australian made inverters since the 1980's. Complemented by SMA and Kaco inverters for Grid Connected systems, we offer service and back-up unsurpassed in Australia.